One of the things God has convicted me of recently is having His Word in plain sight. My Bible time is powerful each morning, but there are so many times throughout the day when I need to be fed a little more. 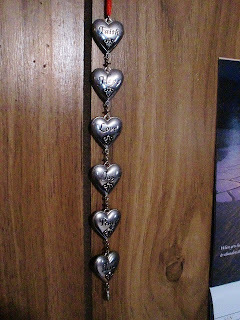 Having Scripture and other words of God's love surrounding me, my husband and anyone who enters my home is of eternally importance. 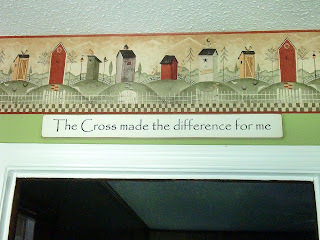 When you first walk into our home you'll see this plaque above the facing door. 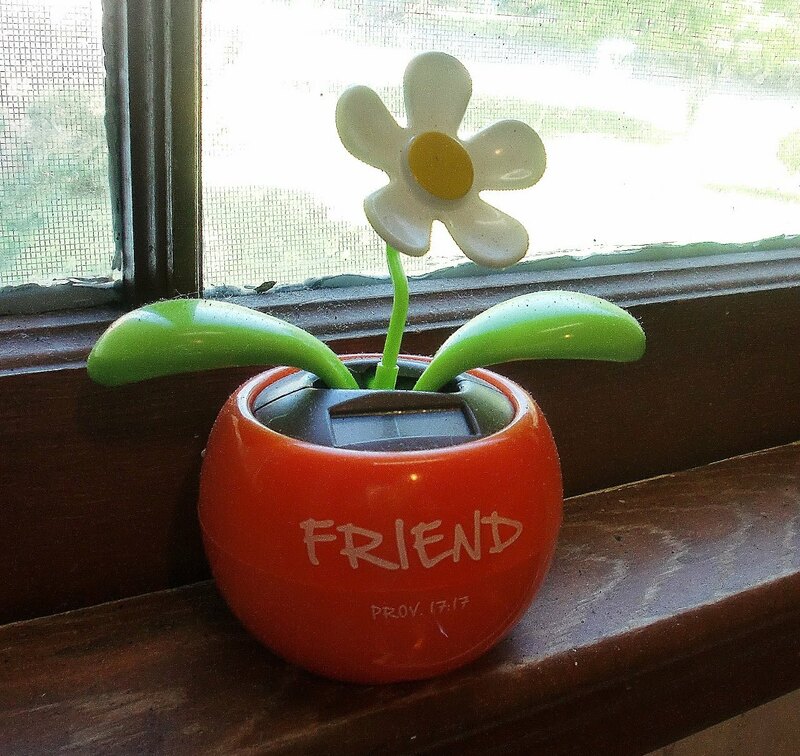 I got it for Danny the week after he got saved and it has had a special place ever since. I want to have those words hit my heart from the moment I come home. 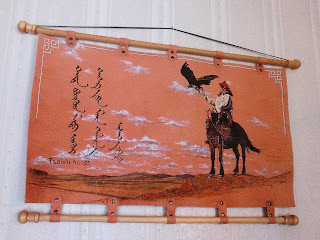 My favorite souvenir from our trip to Mongolia, the script says: But they that wait upon the LORD shall renew their strength; they shall mount up with wings as eagles. Isaiah 40:31. Danny's parents are missionaries in Mongolia, so it has twice the meaning. 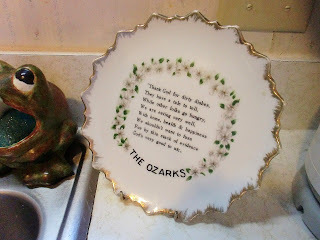 My grandmother always had this plate hanging in her kitchen and I remember from being a little girl. I always hated doing the dishes (still isn't my favorite chore) but I would look at this and get revived. 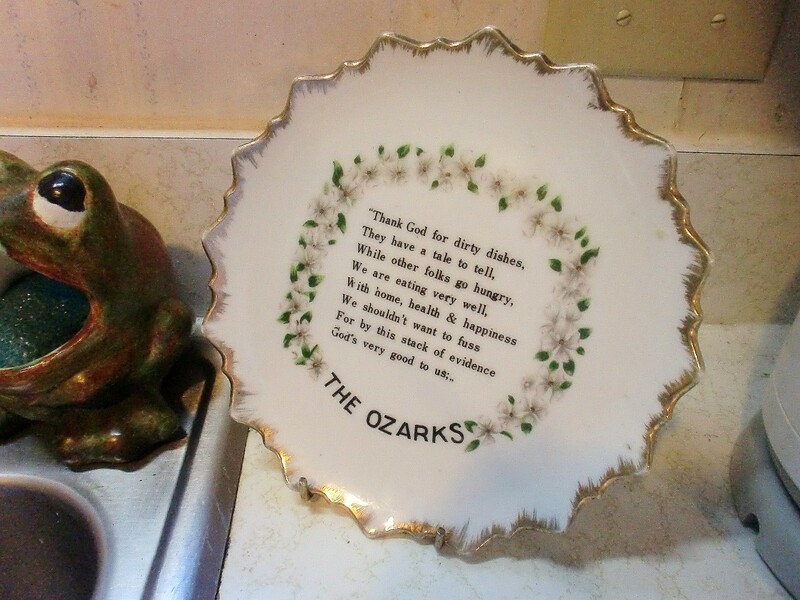 It reads: Thank God for dirty dishes, they have a tale to tell. While other folks go hungry we are eating very well. With home, health and happiness we shouldn't want to fuss. For by this stack of evidence, God's been very good to us. Makes you stop to think. A friend loveth at all times, and a brother is born for adversity. The most wonderful gifts have God's Word attached. 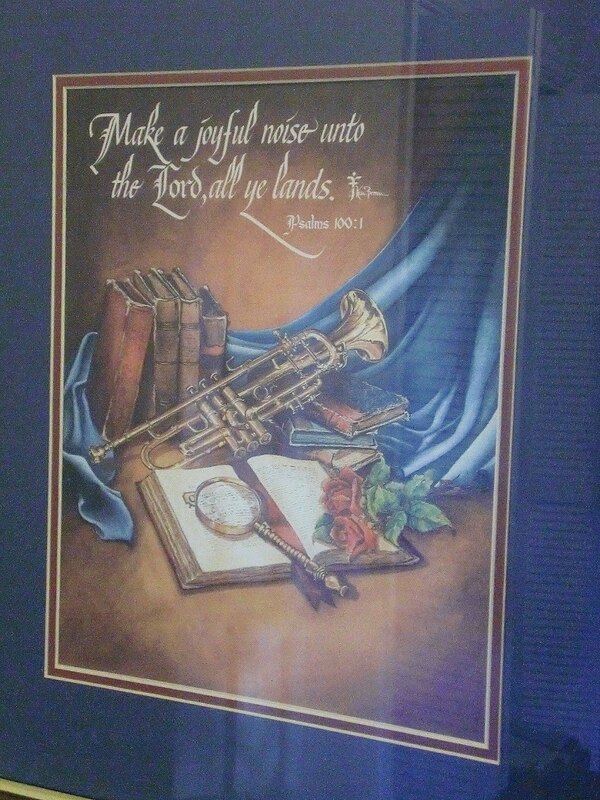 Danny was an Army trumpet player for over 20 years, so this picture has extra-special truth behind it. 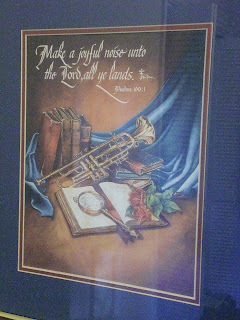 Make a joyful noise unto the Lord, all ye lands. Psalm 100:1. Even on the days I feel like just a noise, I can still be joyful in my Lord. This was my gift to Danny on his first spiritual birthday. Jeremiah 17:7 reads: Blessed is the man that trusteth in the LORD, and whose hope the LORD is. 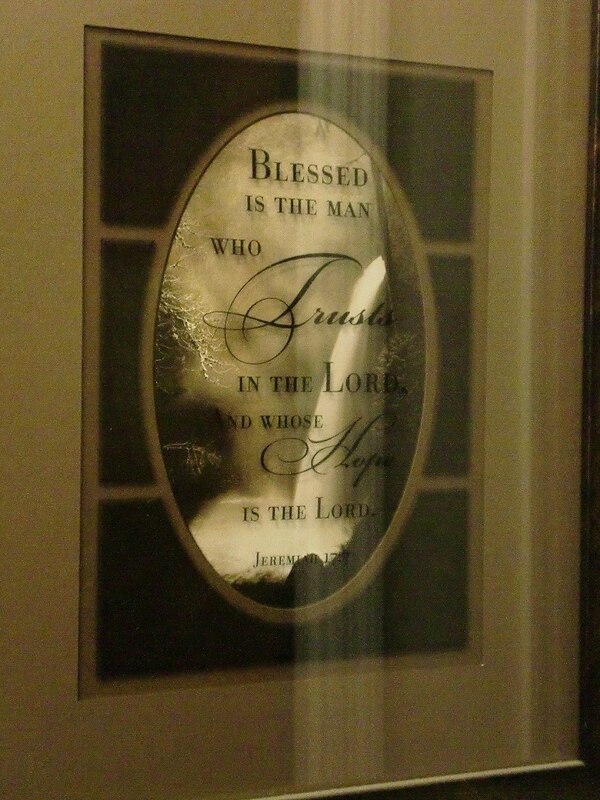 I specifically put this right outside our bedroom door so he (we) have to see it anytime he comes and goes. I adore my Boyds bears, especially the ones with chocolate! 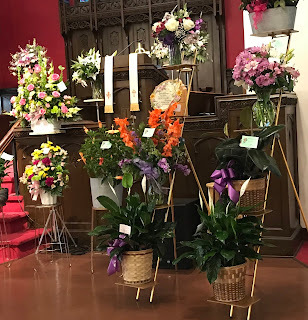 I have military bears, piano-playing bears and even a bear in a typewriter, but the ones that mean the most have God's love written all over them. 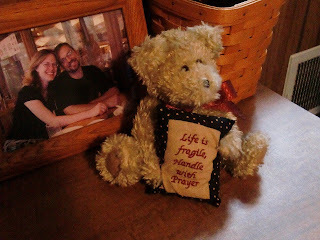 I have the plush one you see here, and the matching resin piece, both in places I can see whenever I need a moment with the Lord. 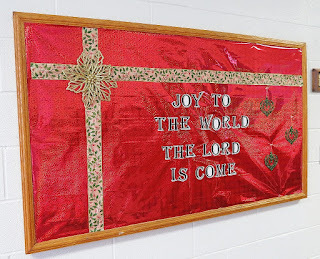 I would love to do a Sunday School lesson based on this ornament. It's a Christmas piece but I leave it up all year 'round. 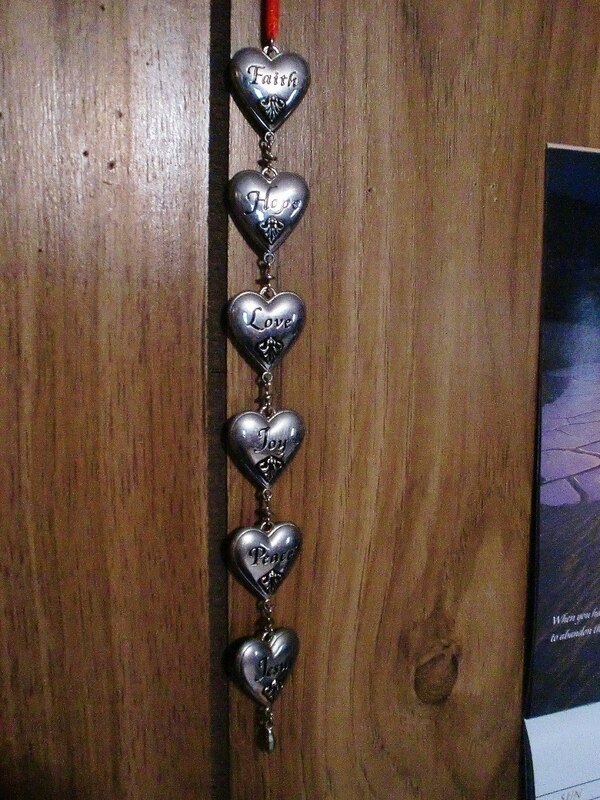 The words down the front of the hearts are faith, hope, love, joy, peace and Jesus. On the back are the coordinating Bible verses: Galatians 2:20, Romans 15:13, Romans 5:5, Nehemiah 8:10, John 14:27 and Philippians 2:9-11. These words are precious 365 days a year. 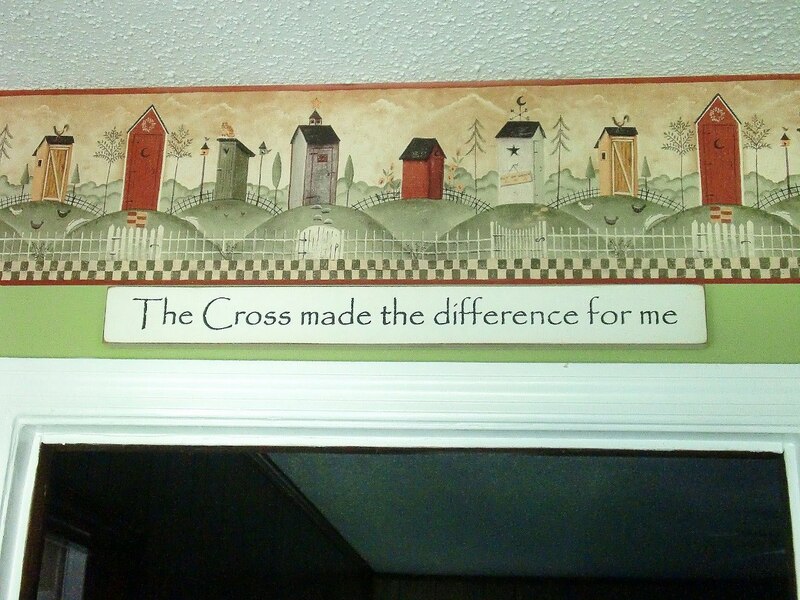 Do you have God's Word in plain sight around your home? What are your favorites? I'd love to know what is precious and joyous to you.